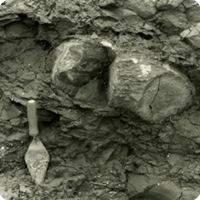 Lenham Quarry shows a section of the problematic Lenham Beds variously ascribed in past accounts to the Miocene, Pliocene, or the Pleistocene. The concensus of opinion at present assigns these rocks to the Pliocene time period on the basis of their contained marine Gastropod and Bivalve fauna, as well as serpulid worms, brachiopods, brtozoans, scaphopods and echinoids. These fauna are important because they place this deposit in a time period that is otherwise poorly represented in the rocks of the British Isles.